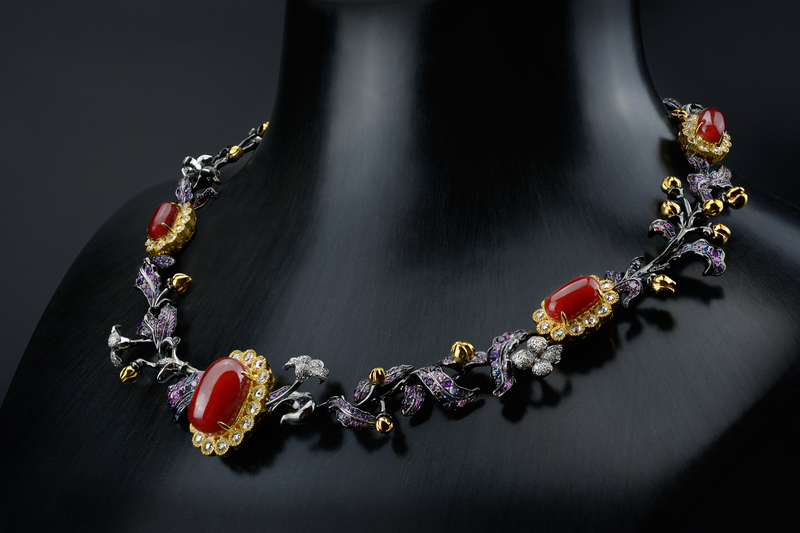 There is a special philosophy and a particular story behind each piece of high jewellery made by Feng J. Being a maverick master with sophisticated high position, Feng J. pushes the boundaries in order to create unique artworks, with no resemblance to anything else in existence. Surrounded by mesmerizing colourful gems palette, she ingeniously creates jewelry of the 21st century. 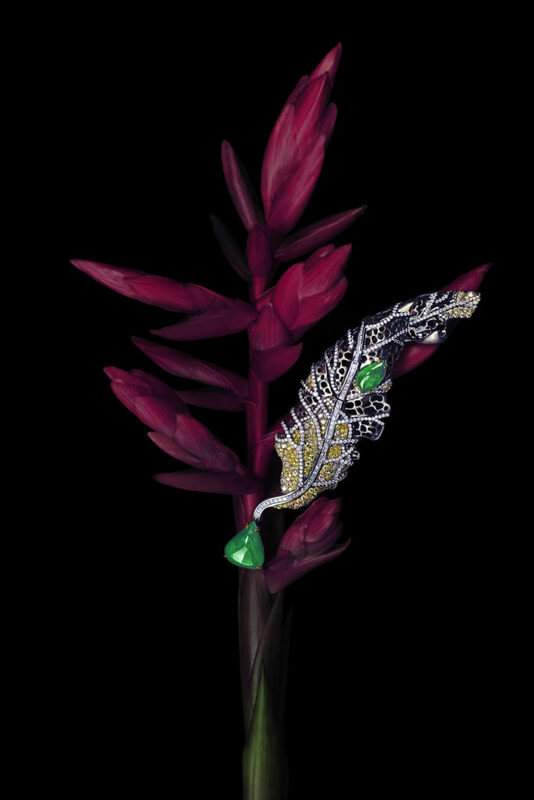 Gemstones in Feng J’s interpretation acquire surprisingly dramatic impact allowing precious items looking thrillingly modern. Like an artist paints, she delicately mixes bold vivid colors, sculptural shapes with oriental and occidental motifs, revealing exquisite craftsmanship, highly valued and appreciated by connoisseurs and world’s foremost jewelry investors. In our exclusive interview with Feng J., find out more about refined perfection of Chinese culture made in Paris. 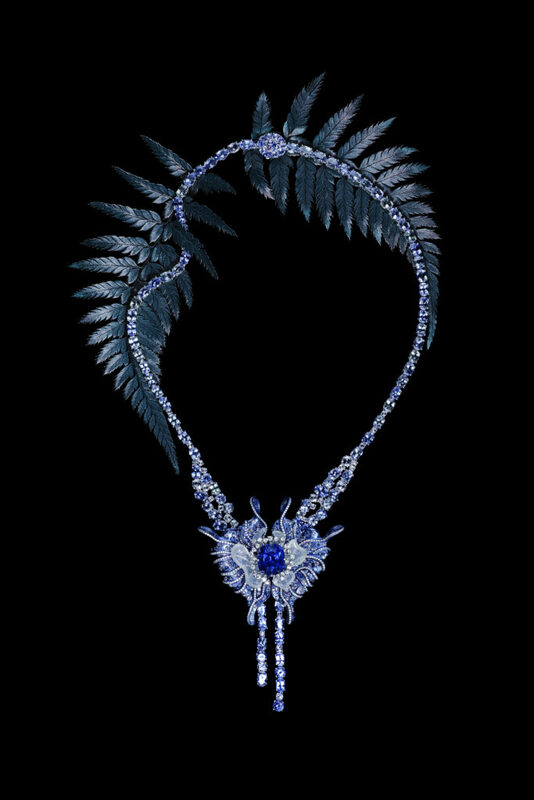 “The set of Orchid necklace” made of titanium and white gold with unheated royal blue sapphire, tanzanites, crystal jade, purple, blue sapphires, diamonds, Feng J. L.C. : When and how did you start making jewelry? F.J.: After I gained my Master Degree of jewelry design from University of Arts London in 2012, I got my G.I.A Graduated Gemologist. I was so addicted with enchanting gemstones, and by that moment, there were some friends like to give me their beautiful gems and appointed me to make bespoke jewelry, I just can’t resist the temptation of making stones alive by creating a unique jewelry piece. I think I chose my lifetime job since then. 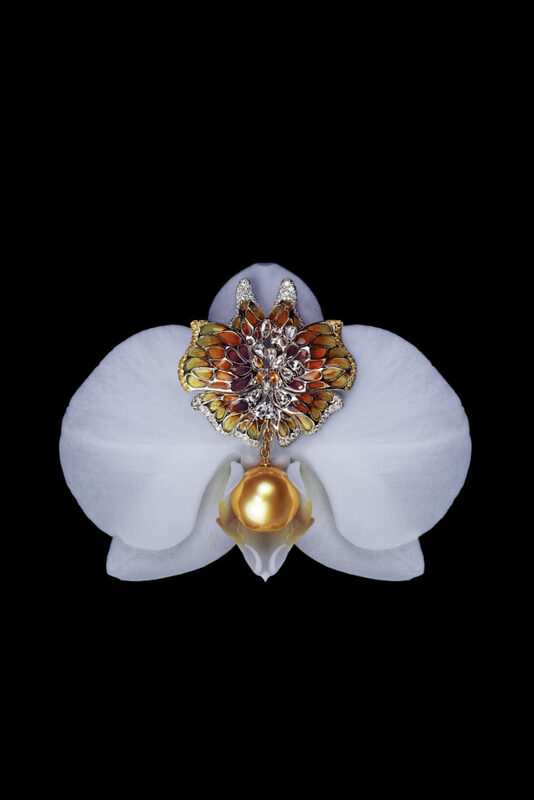 “The Dancing Butterfly Brooch/Pendant” made of white gold with pink sapphires, white diamonds, Feng J.
F.J.: Certainly there will be a starting point to drive me walking along when creating jewelry. I like to observe my clientele silently , I prefer to see instead of to talk, your eyes can see the story. But I love to talk to each single gemstone in my hand ,” how will you like to be given birth? In which form? ” I believe each stone has its drama and spirituality. L.C. : What is(are) your favorite gemstone(s)? F.J: I think I am a gemoholic. My personal affection used to be spinel and star ruby, I like something red and mysterious. But actually I love all kinds of stones, in a mature designer’s eye, there are only concept and signature style to make stones get most attracted. “The Bamboo Spiritual Earrings” made of white gold with Imperial jade, emeralds, white and black diamonds, Feng J.
F.J.:I was born in 1985, being surrounded with full of aesthetic effects . My great-grandfather was a famous court painter who made the Chinese painting for the royal family of QING Dynasty, nowadays I still keep his heirloom seal as enlightenment for inspiration of bespoke commission. It’s a spiritual inheritance in the root, till now I recalled in my childhood, there are so many collections of art pieces hanging on the hall wall. I am a designer of East-Meets-West fusion, and I admit subconsciously I borrow the memory of family’s Chinese convention. And of course, museum, gallery and travel are all the sources of inspirations. 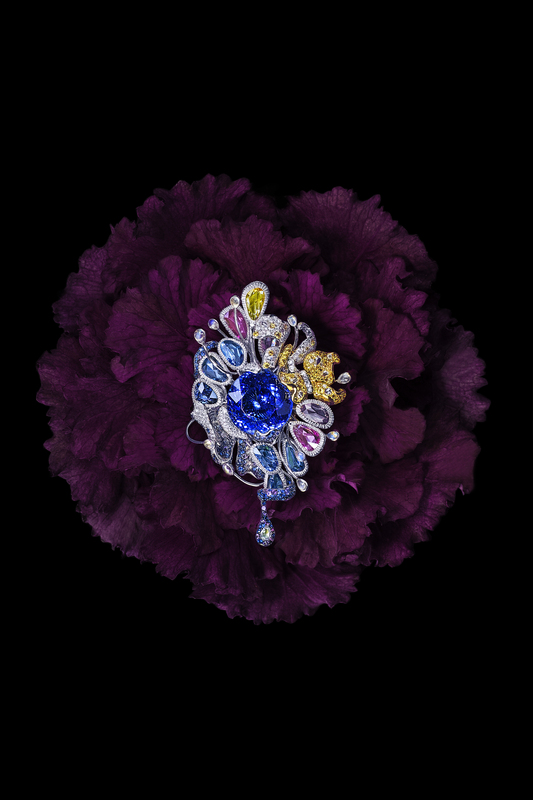 “The Botanic Garden Necklace” made of white and blackened gold with corals, purple, blue, pink sapphires, white diamonds, Feng J.
F.J.: I enjoy working with my craftsmen at the atelier, some in Paris, to challenge each other how to improve the piece making it more creative and unique. Make jewelry is like give birth, design is the beginning part, the production is about to make design alive, this really depends on how to work together in the best chemistry at the atelier. I use a lot stone-carving, sculptural form, electroplate and titanium casting, I like to be at the scene and endorse the piece get turned alive, full of excitement. F.J.: Sure, jewellery is another form of a woman, it’s a presentation, from inside to outside, to make one’s temperament appearing at the first glance. 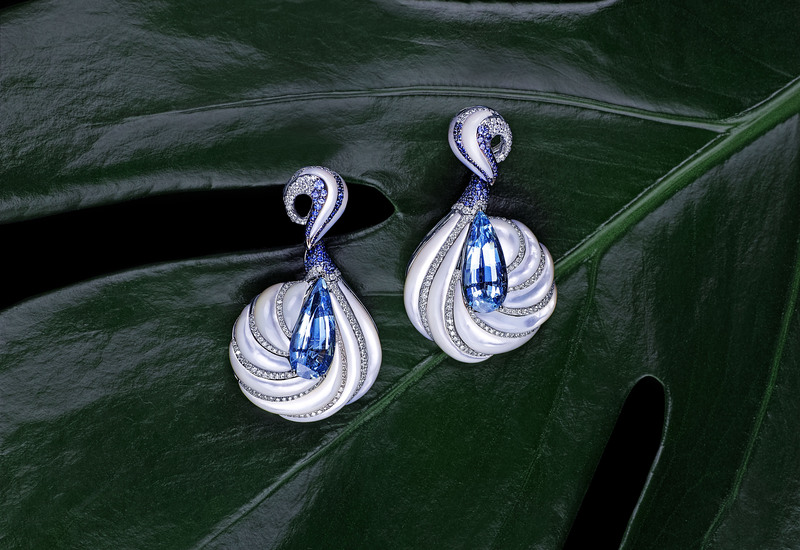 “The Alhambra Earrings” made of white gold with aquamarine, pearly shell, blue sapphires, white diamonds, Feng J.
F.J: Indeed I rarely wear jewelry at daily life. I always sit at my working desk to imagine what style of jewelry other women will be wearing to look best. 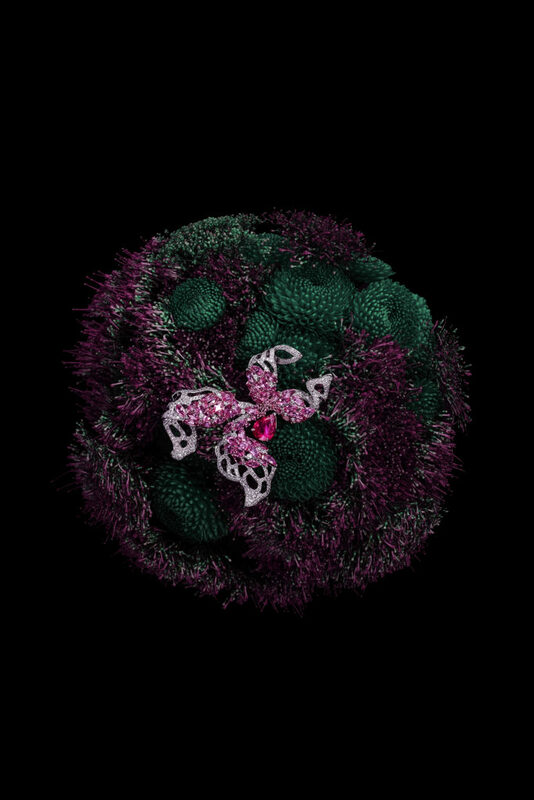 In case I will attend a big event or important occasion, I will like to wear a big brooch with my own signature style. F.J.: That will be J.A.R( Joel Arthur Rosenthal ), he is so enlightening and stimulating. In my mind, he is a kind of Da Vinci in jewelry industry, very inventive, creative and dare to challenge. “The Gold Butterfly Pendant” made of yellow gold, enamel with south sea golden pearl, rose cut diamonds, yellow sapphires, yellow and white diamonds, Feng J. L.C. 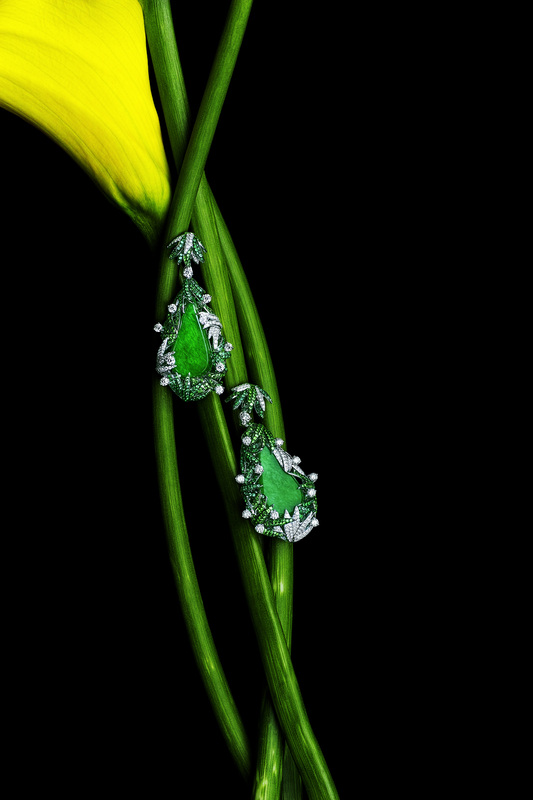 : Please share with us your plans for Feng J. Haute Joaillerie for the next years. 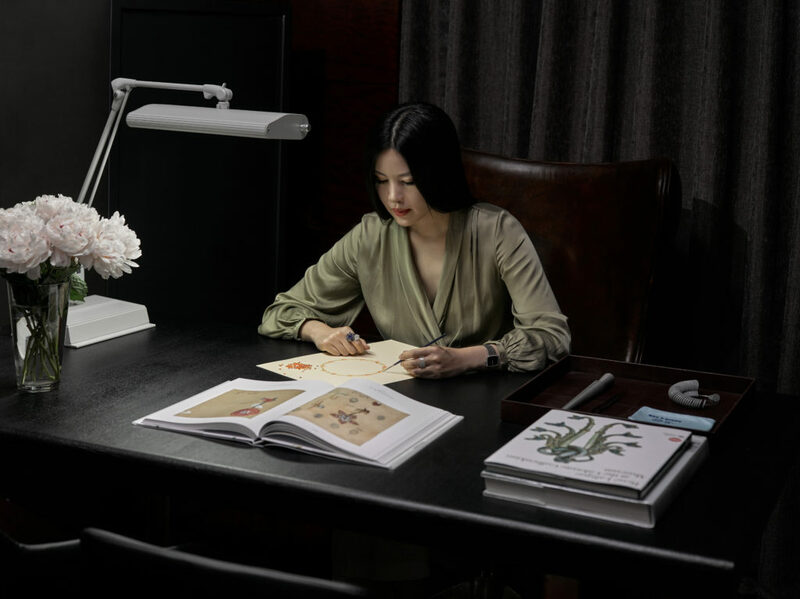 F.J.: Lots of things will be exciting to achieve, I will be planning an exhibition of 100 my exclusive pieces in Paris next year, also have the initiative idea to publish a book of FENG.J Haute Joaillerie, which will showcase more of my artistic pieces. And my Shanghai showroom is about to newly renovated and open soon. L.C. : Three key words that define Feng J. Haute Joaillerie. 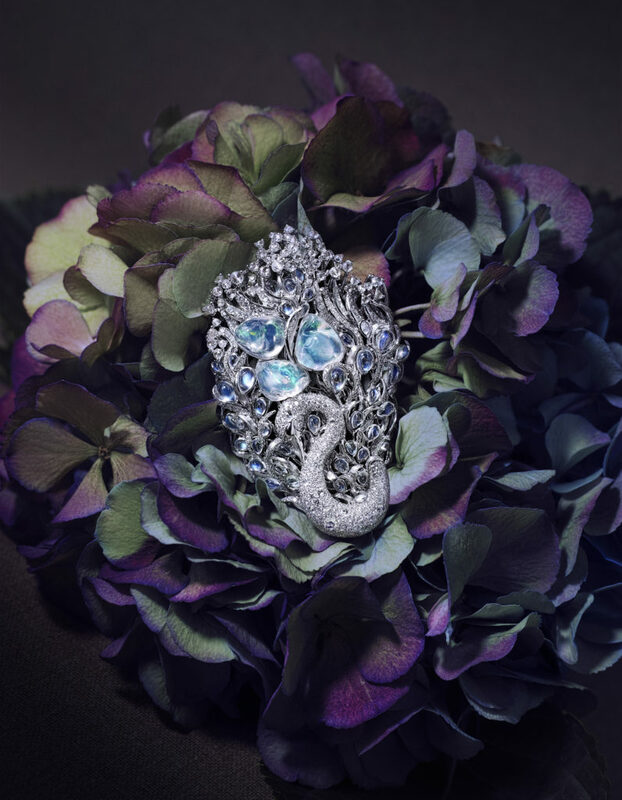 “The Swan Lake Brooch” made of white gold with crystal opal, moonstones, rose cut diamonds, white diamonds, Feng J. 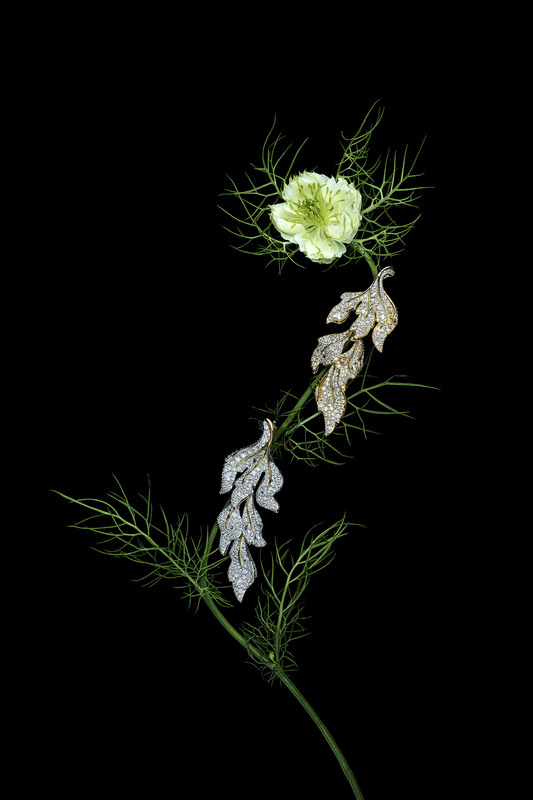 “The Leaf of Season Earrings” made of white and yellow gold with diamonds, Feng J. “The Goddess of Victory Brooch” made of white gold with imperial jade, yellow and white diamonds, Feng J. “The Tuileries Garden Brooch/Pendant” made of white and yellow gold with tanzanite, yellow diamonds, sapphires, fancy coloured sapphires, white diamonds, Feng J.